Facts About Amber Jewelry. Learn from Amber Jewelry experts. Like the lands from which it was birthed, Amber Jewelry has an intense history from initial discovery in the Baltic region to gracing priceless artifacts and members of royalty to healing properties that defy science even today. There is so much to learn, to know, and to inspire that volumes cannot convey the beauty, the mystery, the ultimate uniqueness that is Amber. Artisans, jewelers, kings and princesses have fallen in love with this magical stone and produced incredible works of art dedicated to its mystery and unparalleled natural beauty. To understand why Baltic Amber is so precious, you first need to understand that Amber isnt just the centerpiece of an elegant necklace or bracelet. 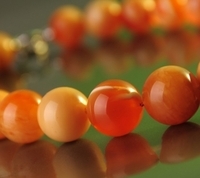 Amber is the most precious natural material any artist can work with or wearer can enjoy. Because natural Amber is alive  not metal or mineral. Ambers composition is such that it has no equal, no competitor. And it never has. At one time many centuries ago, Baltic Amber was not always in the limelight. Unlike glittering diamonds or similar gems, Ambers more subtle, natural beauty was not the first choice for jewelry statements. Yet it was not unusual for Amber to be considered a very highly prized gift for royal families. While the distinctly unique properties of Amber were yet to be fully appreciated to certain audiences, Amber retained its place in an ever evolving world of speculation because its unique medicinal properties were deeply anchored in society throughout the ages. For example, Amber in the form of ground powder was highly regarded for curative purposes. Amber Jewelry is without comparison for more than its naturalness. Amber is actually resin containing a very rare substance known as Succinic Acid, a substance that is also found in our own immune system and is considered the core element of therapeutic treatment. Since ancient times Baltic Amber has been used in making Amber Healing Jewelry. When heated, Amber becomes soft and pliant and exudes a wonderful fragrance of pine indigenous to the Conifer trees of ancient times. In this state, it hails to the natural forests that existed over 50 million years ago from which Amber was actually formed. Because Amber is soft and malleable, artists and artisans can create unique esthetically pleasing shapes. The variety of colors and regal Shades Of Amber, whether opaque or clear, lay the foundation of opportunity for spectacular designs to complement any fashion statement or to be the center of attention. With techniques that include thorough and repetitive polishing and precise cutting, true Amber Artisans continue to provide Masterpieces In Amber that will always stand the test of time. There are also Baltic Amber Imitations on the market so it is important to ensure youre your purchase is genuine. In order to test authenticity, you can carefully heat a needle and touch it to the Amber. Genuine Amber will react to the heat by producing a fragrant odor like natural pine. Anything other than pine and chances are the substance is plastic. Or you can rub a piece of cloth over the surface of the Amber and the same pine fragrance should now be on the cloth. While Amber will not melt, it will burn and produce the ancient pine scent. Another way to test is to put Amber in a bowl adding 1 part salt to 2 parts water. Genuine Amber will always float on the top whereas plastic or copal- a common fake amber - will sink. As with any fine jewelry, Amber will maintain its value in the coming decades. To Protect Amber Jewelry, you should gently clean each piece with warm water and a soft cloth. Never use any form of detergent, soap, or cleanser as that can harm your Amber by attacking the resin. Again, protect your Amber from extreme elements such as very hot or very cold temperatures as this can also cause damage or deterioration. When youre not wearing your Amber Jewelry, always be sure to wrap each piece in a soft cloth for protection before safe storage. Whether youre a believer in the incredible natural healing power of genuine Amber or an admirer of the odyssey that Amber has made over millions of years, there is no denying that Amber is unique and indeed very special. And every time you wear your Amber Jewelry, you can be inspired by the magic  and mystery  that has given Baltic Amber a reputation and a reverence that no other gem has ever known.